Want to reach and connect with your clients in a whole new way? Social Media Marketing is the answer! If you are looking to connect to all of your customers and let them know you appreciate them, then Social Media Management is exactly what you need. There are many Social Media companies that offer services such as article posting, but neglect to engage your company with its customer base. Social Media these days is all about establishing a community, which can help you increase your outreach and gain new customers. Congratulating customers on their engagement or marriage lets them know you care! Even wishing them a happy birthday goes a long way when it comes to making a good impression on your current and potential clients. 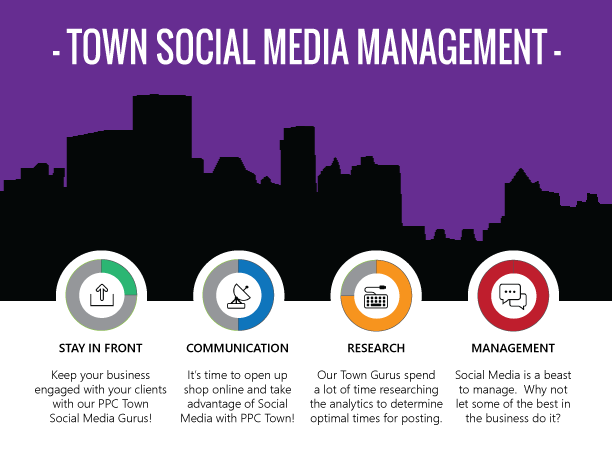 PPC Town provides quality top notch dealer social media management. Businesses need to take advantage of online communication by way of Social Media. The world of information happens so quickly, and those not ready to adopt it can fall behind if they are not reaching their customer base. Customers are online most of the day. According to Google, people check their phone over 180 times per day. Social Media updates could be part of that. Businesses can take advantage of this mobile trend and PPC Town can show you how. Knowing how your customers are finding you (or not) is huge in tailoring a solution that fits your business and market. PPC Town Gurus do research with Social Media sites to find the most optimal time to do advertising and posts to promote. There’s no reason just to throw something out on Social Media without having data to back up the what, when and why (not to mention your target base). Let our Town Scribes help write the best advertisement to reach the most people and in turn get the best ROI possible. Social Media Management is a tricky part of business communication. If a business does not stay on top of it, Social Media can quickly overwhelm that business and start doing more harm than good to the business. Why? Social Media, while providing an avenue for the smallest of businesses to reach many potential customers, can backfire to a business if no one at the business is at the helm steering the ship. Stagnate posts from over a year a go as the “most recent” posts would be a prime example.